2 of the biggest trends in the online slot world in 2018 have been the MegaWays game engine and the Norse epic theme. 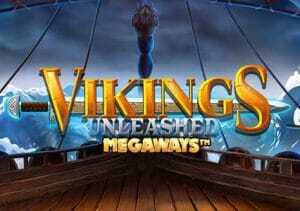 Blueprint Gaming has joined them together to create Vikings Unleashed MegaWays, a superbly entertaining game that looks and sounds terrific and comes with plenty of potentially explosive features. They include cascading reels, transforming symbols and free spins with expanding multipliers. Set sail from between 20p and £10 per spin. Blueprint Gaming are at the top of their game here both in terms of design and features. The visuals are fantastically well done. The reels are set on a Viking longboat where you’ll find A to 9 values plus 4 higher paying members of the Viking crew. The bearded warrior with the Mohican haircut is the top symbol, paying 2, 5, 10, 25 or 50 times your bet if you land 2, 3, 4, 5 or 6 on adjacent reels. There’s also a wild. The MegaWays game engine means that there’s a different number of symbols on each reel on each spin. When the reels are fully extended, you’ll have 117,649 potential ways to win. Every time you land a winner the successful symbols are removed and new symbols drop in and replace them. If this also results in a winner, the process is repeated. The ‘reactions’ keep on coming as long as a new winning combination is created. Keep a special eye out for the hammer symbol. When these land, they all transform into the same matching symbol and a new payout combination is made. This is known as the Mystery Symbol feature. The main feature is the Battle of the Seas Free Spins feature which is triggered by landing 4 or more scatters on the same spin. That will get you 12 free spins. Each extra scatter awards another 5 free spins on top of that. Before the free spins begin, you’ll get the chance to spin the gamble wheels in the Gamble feature. These can increase the number of free spins and the starting multiplier in play. If the pointer lands in the green segment, your gamble has succeeded. Land in the red and you’ll lose the feature altogether. The cascading reels are in play during the free spins round. Every time you land a cascade win, a flash of lightning strikes the reels to increase a multiplier by 1x. These only go up during the free spins and has no limits. Landing 3 or 4 scatters adds another 5 or 10 free spins to your tally with, again, no limits. The transforming hammer symbol can hit here too. If you’re impatient and don’t want to wait for the scatters to trigger the Battle of the Seas Free Spins feature, you can buy your way in via the Free Spins Unleashed Bet feature. 5, 8, 10 or 12 free spins with a starting 1x multiplier will set you back 25, 50, 75 or 100 times your total bet – again, you can gamble for more! We found plenty to enjoy in Vikings Unleashed MegaWays. The sound, visuals and animations are uniformly excellent. That’s doubly impressive given all the moving pieces in the MegaWays game engine. The features stack up well too, especially the explosive Free Spins Unleashed Bet feature. We managed to win almost 750 times our bet from 1 round of free spins after the multipliers started moving. Both the MegaWays game engine and the Viking theme have been big hits this year. Blueprint Gaming has combined them to superb effect. If you like the Norse theme, the MegaWays set up or just fancy playing a well-designed game with some cracking extras, then Vikings Unleashed MegaWays should fit the bill. I also recommend you try other MegaWays titles from Blueprint Gaming with Primal MegaWays and Buffalo Rising MegaWays worth playing.